"This is a recipe that my grandmother made ever since I can remember (I'm 58). I bake the potatoes like she did and serve them with pork or chicken. It's a favorite of my father-in-law who always asks for them when he comes for dinner." Preheat oven to 375 degrees F (190 degrees C). Place butter in a large baking dish and melt in preheating oven. Toss potatoes and onion in melted butter to coat. Bake in preheated oven until potatoes are tender, about 40 minutes. Sprinkle parsley over potatoes and season with salt and pepper; toss. Watch how to make doubly delicious twice-baked potatoes. Make sure to coat potatoes well. That will give them a nice browned and slightly crisp coating. Can be cooked with meat in same oven, just add more time if cooking at a lower temp. These can also be made ahead of time and just reheated without losing flavor or texture. They also freeze well. Very simple easy recipe! I will make these again! Perfect recipe, except I cut the butter in half and it was still wonderful! I made the recipe as written and my family loved it! 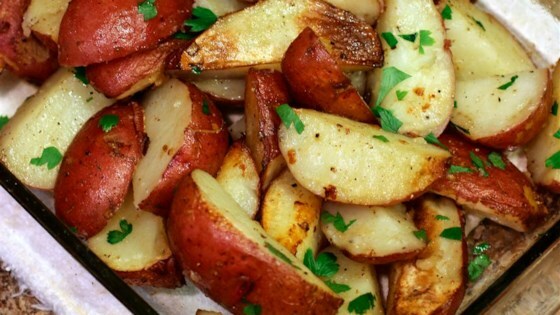 It is a great basic recipe for roasted potatoes. Made it for a crowd, everyone loved them. Wouldn't change a thing.